Despite having quite a bit of time, I ended up knitting and re-knitting this sweater 3 times. The first time, it was simply too big and would fit the baby in mind in August. The second time, I was carrying the yarns too tightly, and one button band was significantly shorter than the other. With only a few days before the baby shower, the third time was the charm! Basically, all the details are the same as the first time I knit this sweater. Such a great pattern – not much tweaking is needed, really. The yarn colors here are Gilded and Baltic, and I’m happy to say there was truly minimal bleeding, thank goodness. So far I’ve worked with 6 different colors of Tosh Vintage, and it’s just the Oceana that’s given me trouble in terms of bleeding. I tweaked the stitch counts ever so slightly because my gauge was different than specified, and I really wanted to get as close as possible to the newborn size (the recipient is expected in mid-February). The buttons were from my local Joann’s. Not as exciting as the ones from Windsor Button, but very cute and not totally plain. The hat is basically the magic coffee baby hat, except with a garter edging to match the sweater, no loop at the top, knit flat (so there’s no color jog), and adjusted for a different gauge. But I swiped the desired circumference – 13″ – and depth to knit before decreasing – 4″ – from this pattern. The expecting mom was thrilled! Success! i love the saturation of those colors for baby! beautiful combo for a not-your-typical baby gift. gorgeous! Adorable! That edge next to the buttons is perfection. Hmmm… my sister-in-law is expecting in March(?) and I am feeling like I should make her a baby sweater (we’re not very close, so I’m debating). I’ve seen this one several places, so it’s definitely in the running. 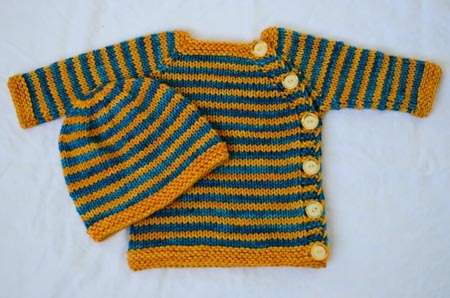 And my sister had twins in September – finished a Baby Surprise for the girl but I owe the boy a sweater. Love the hat, too. That is super cute. I have too many babies to knit for in the next couple of months, so I should get cracking! The sweater and hat are beautiful! It seems that the deeper blues are the ones that run in the Vintage. I know that my Seawash does still (socks) and it has the darker blue. What a bright, happy color combo! 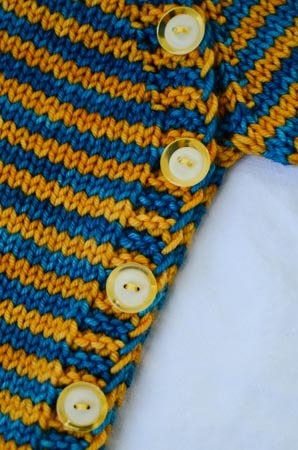 I love the way the stripes go all the way across the button band too.